Director – Umberto Lenzi, Screenplay – Tony Corti, Jose Luis Delgado & Piero Regnoli, Producer – Diego Alchimede, Photography – Hans Burman, Music – Stelvio Cipriani, Makeup – Giuseppe Ferranti & Franco Girolami, Set Design – Wolfgang Burman. Production Company – Dialchi Films/Lotus Internacional Film. TV journalist Dean Miller goes to the airport to interview the scientist Professor Hagenback about a nuclear spill. While they are waiting for the professor’s arrival, an unidentified plane lands. The military and police surround the plane as it spills open to reveal the professor and a horde of others. They have been transformed into zombies and rapidly attack and massacre the soldiers. The zombies then spread out into the city. It is theorised that they have been created by the nuclear spill. Miller tries to escape with his wife Anna as the zombie horde overruns the entire city and countryside. The Italian zombie film was a genre unique to the 1980s. There had been the huge worldwide success of George Romero’s Dawn of the Dead (1978), which was co-produced by Italy’s Dario Argento. Italian filmmakers quickly jumped onto the trend, beginning with Lucio Fulci’s Zombie – Flesh Eaters (1979), known in Italy as Zombi 2 and promoted as an unofficial sequel to the Romero film. Other filmmakers leaped into the fray over the next few years with the likes of Burial Ground (1980), Cannibal Apocalypse/Cannibals in the Streets (1980), City of the Living Dead (1980), Zombie – Creeping Flesh/Hell of the Living Dead (1980), Zombie Holocaust/Dr Butcher M.D. (1980), The Beyond (1981), Dawn of the Mummy (1981) and Demons (1985). Umberto Lenzi was a director who had been operating in the Italian exploitation genre since the 1960s, churning out works in the peplum, spaghetti Western, spy and giallo genres. (See below for Umberto Lenzi’s other films). A few years earlier, Lenzi had made Deep River Savages/The Man from Deep River (1972), which created the Italian cannibal film, a genre that was responsible for pushing the gore envelope to a greater extreme than any other films in this period and gave birth to other notorious films like Cannibal Holocaust (1979) and Lenzi’s Cannibal Ferox (1981). These two films in particular courted notoriety for featuring the slaughter of animals on camera and were banned in numerous countries. 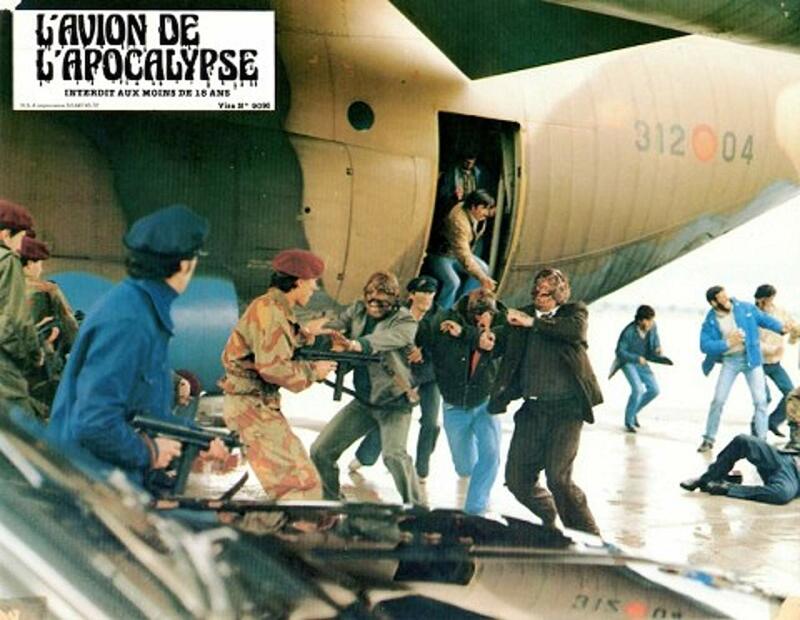 Nightmare City opens with great effect as a mystery plane lands at the airport and spills its passenger complement who immediately start attacking the police and soldiers surrounding the plane, resulting in a bloodbath with zombies stabbing, slitting throats, biting necks, tearing flesh out, turning guns on and even severing the arms of the assembled forces of law and order. Here Umberto Lenzi throws us into the midst of what the Italian zombie film was all about – enthusiastically cheap and cheesy gore effects applied with gusto. It is a sequence that, bar the cheapness of the effects, would have left George Romero envious that it were something he himself had not conceived. Umberto Lenzi appears to have attained a halfway decent budget and allows the film to take place on a lavishly widespread scale. He gets into the gore effects and zombie attacks with an enormous degree of enthusiasm – the film is like the kid in class who doesn’t have much skill but who throwsthemself into what they do with wholehearted if roughshod abandon. The makeup effects are plentiful but not always that convincing – the hideous zombie makeups often end at the actor’s neck, for instance. Lenzi never pushes the envelope as far as he did on Cannibal Ferox but every so often there is one effect that makes you do a double-take – a woman getting her breast sliced off; a gory scene where one victim’s eye is gouged out with a poker; the back of Maria Rosaria Omaggio’s head being seen blown out with a bullet. Oh, and these zombies also manage to strip the tops off the women with a great deal of regularity. The zombies are slightly different to what we are used in terms of their accepted cinematic behaviour – here they seem much more calculating and intelligent than usual, doing things like driving cars, cutting phone lines, using weapons, even destroying a power plant. Nightmare City was made not long after the Three Mile Island nuclear accident was in the news, which in turn inspired a number of films – most notably The China Syndrome (1979) – and so the zombie attacks are now allied to a nuclear spill as cause. Everything ends on the “all a dream but about to happen for real” ending that we have seen in films such as Dead of Night (1945) and Invaders from Mars (1953). The dubbed dialogue is customarily terrible. Umberto Lenzi had a prolific career making low budget films between the 1950s and 90s, working in numerous Italian exploitation genres. His other genre films include:- the superhero film Kriminal (1966); the spy film The Spy Who Loved Flowers (1966); the giallo Orgasmo/Paranoia (1969); the giallo So Beautiful, So Perverse (1969); the giallo An Ideal Place to Kill/Oasis of Fear (1971); the cannibal film Deep River Savages/Man From Deep River (1972); the devil worship film Knife of Ice (1972); the giallo Seven Blood-Stained Orchids (1972); the giallo Spasmo (1974); the giallo Eyeball (1975); the cannibal film Eaten Alive/The Emerald Jungle (1980); the cannibal film Cannibal Ferox/Make Them Die Slowly (1981); the sword-and-sorcery film Iron Master (1986); the haunted house film Ghosthouse (1988); the occult film Hell’s Gate (1989); the psycho film Hitcher in the Dark (1989); the slasher film Nightmare Beach (1989); and the occult film Demons 3/Black Demons (1991).